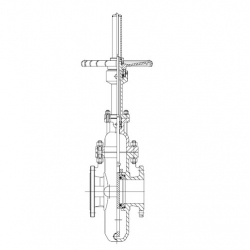 Through conduit slab gate valves are usually used for the oil & gas pipe-lines. Through conduit slab gate valve are manufactured with a full bore, slab gate, rising stem OS&Y and floating seats. Slab gate is a simple solid gate design, featuring metal-to-metal seal between gate and seats, to apply for the most severe service condition, including corrosive and abrasive fluid environments. A floating seat is designed to match the slab gate. A belleville spring and O-ring between each seat and body ensure a tight seal against the slab gate. The floating slab gate uses the natural force of line pressure to obtain a dynamically tight downstream seal in high-pressure differential applications. Low-pressure sealing is accomplished with an o-ring that energizes the seat and minimizes corrosion and debris build up. Common trims are available. The smooth, continuous bore minimizes turbulence within the valve and when in the open position it produces a pressure drop equivalent to a portion of pipe of same length and diameter. The seat faces are outside the flow stream and therefore protected from the erosive action of the flow. Pigs and scrapers can be run through the valve without damage. 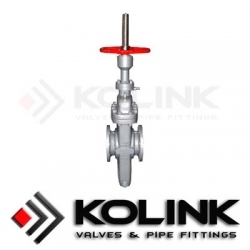 Through Conduit Slab Gate valve design minimizes and eases the maintenance allowing for the service operations to be done without the removal of the valve from the line.